Lucky us: We found the perfect photo background. Photo courtesy of Jeannie Garcia. 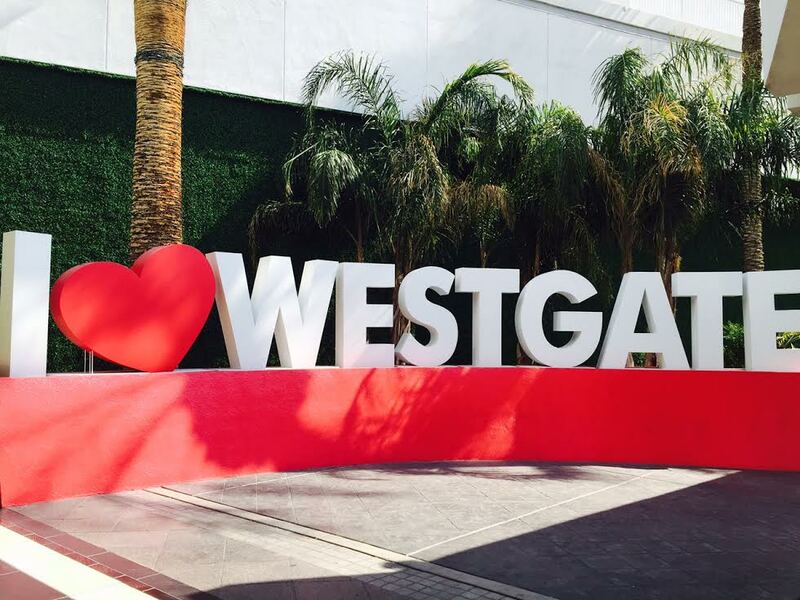 Previously known as The International, Las Vegas Hilton, LVH and now Westgate Las Vegas Resort & Casino, this Las Vegas hotel has definitely had its share of name changes and rebranding. When it opened as The International in 1969, it was the largest hotel and casino in the world. This is also where Elvis Presley performed 837 sold-out shows, with a total of 2.5 million show goers. That’s a whole lot of hunk a, hunk a burning love. 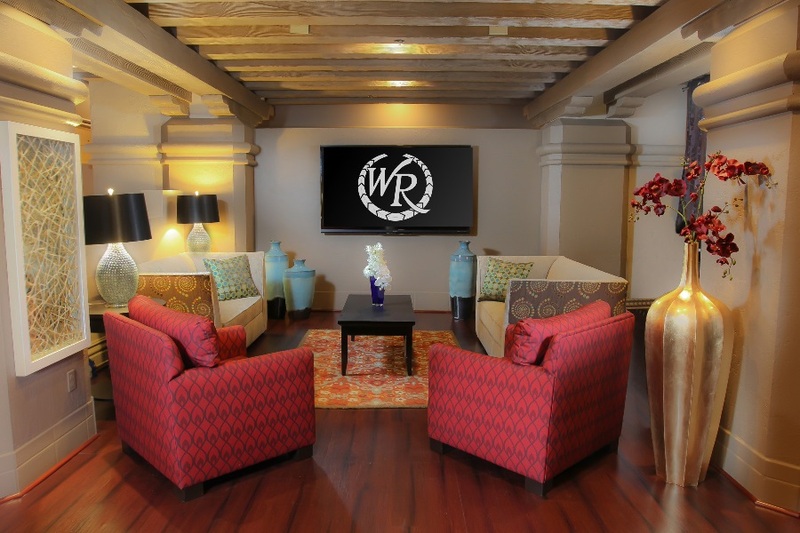 While this property has undergone several changes through the years, Westgate Resorts founder and CEO David Siegel stays true to the roots of the original hotel. Examples the 24-hour Sid’s Café serving up The King’s favorite: peanut butter and banana sandwiches. Plus, the bronze statue of Elvis stands tall in the hotel lobby and other Elvis décor sprinkled throughout the hotel. So you can technically say Elvis has not left the building. But let’s fast forward to today: With $100 million in renovations, the Westgate has gotten a major makeover ranging from its guest rooms and swanky pool deck to restaurants and massive casino. We invite you to take a gander. Oh hi, Marilyn. The remodeled Signature room has chic touches and great views. All photos courtesy of Westgate Las Vegas Resort. Get a room! No, seriously. These rooms are nice. The Westgate remodeled more than 1,000 rooms over the past year. This includes newly-painted walls, brand new carpeting and marble flooring. But now to the fun stuff. The Signature rooms have a cool, retro chic vibe. Here you’ll find art featuring James Dean or Marilyn Monroe (seen above). We also like the Hollywood-inspired black leather touches seen in these revamped rooms. Each room features an oversized mirror, make-up mirror and an oversized shower and tub. 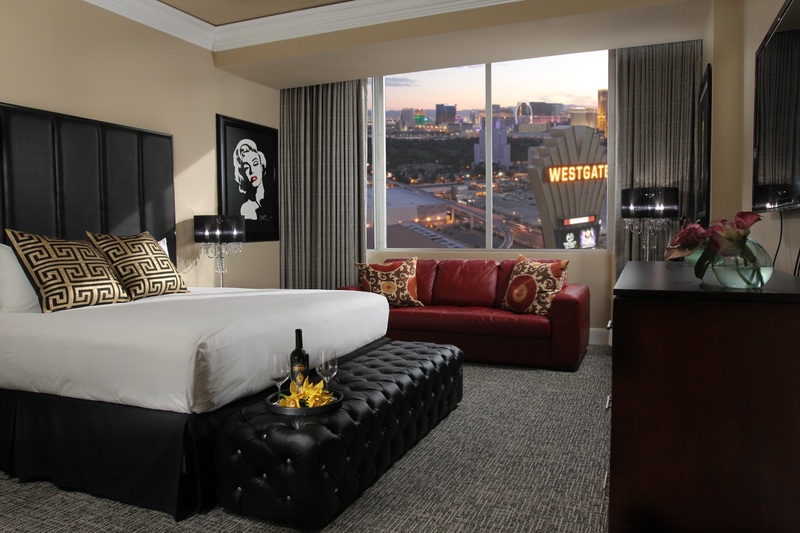 In the Signature king rooms, you can curl up on a red pullout sofa and enjoy the view. Speaking of views, you can’t beat ’em: You’ll either have a view of the attractive Las Vegas Country Club golf course or the glittering Las Vegas Strip. Other amenities include 60-inch LED flat-screen TVs, mini fridges and single cup Keurig coffee makers. For an upgrade, the one-bedroom villa has a kitchenette, two flat-screen TVs and a two-person jetted tub. And how convenient: There is a shaving mirror in the walk-in shower. Or, opt for the 400-square-foot Studio Suite, Westgate’s newest room type. 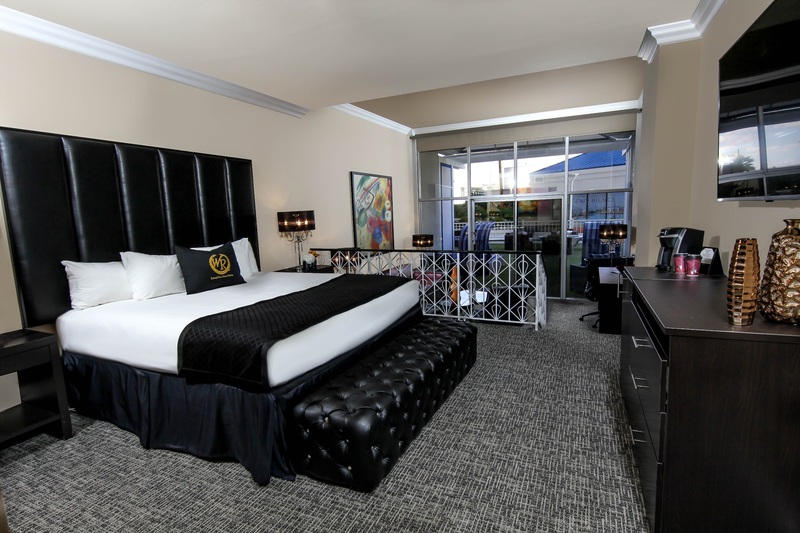 Adorned in gold and black, this suite includes a rain shower (complete with in-shower shaving mirror) and a wet bar. The Concierge Lounge is one of the many upgrades you’ll find here. It does cost an additional $40 per day, but hey — the food and drinks alone make it all worth it. For super easy access to the lounge, you can stay in a concierge level room. Guests who book a concierge level room have automatic access, but you can also get this upgrade when checking in. If you’re curious about the timeshares here, there are only 200 of them. Select timeshare suites include a kitchen, wet bar, jetted tub, living room, and multiple bedrooms. When renovation is complete, some timeshares will be able to accommodate up to 12 guests. 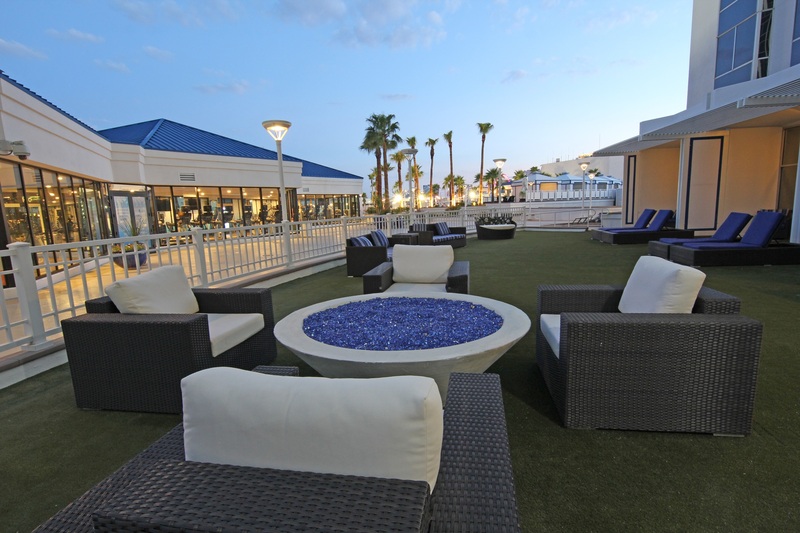 One of the several reasons to get a suite: Mix and mingle with other guests at the Lanai Suites’ shared patio. Our favorite room is the remodeled 450-square-foot Lanai suite and its shared Lanai suite patio. And forget cracking a window: You can enjoy fresh air and socialize with other guests, just outside your room. These are generally available as a reservation upgrade upon check-in. The unique layout has a loft-style setting, with the bedroom and living room on different floors. Fresh air is only a couple steps away. Thankfully, it’s available to everyone, not just VIPs. There are about 30 of them. You’ll notice it has the same awesome décor as the Signature rooms. This suite type is easily one of the property’s standouts and honestly, has the best location since it’s only a few steps to the pool. There’s more than enough space to stay cool and sunbathe. Speaking of pools, the Westgate’s pool is absolutely gorgeous. The third floor pool deck is the ideal spot to relax and sunbathe. There is a hot tub and even a grill if you feel like barbecuing. 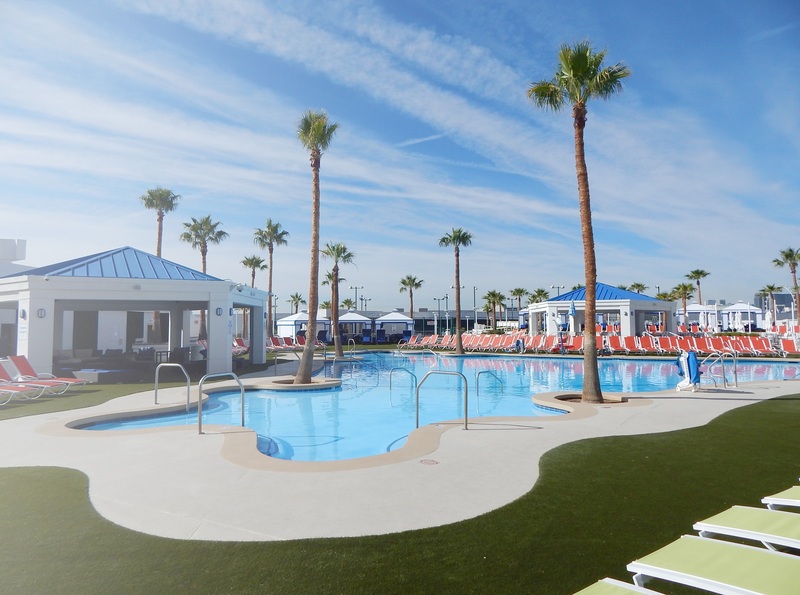 The pool features new TVs and deck furniture, as well as new daybeds and cabanas. Cabana rentals are reasonably priced and start at $75. Add some luxury to your fun-in-the-sun day with a poolside massage, ranging from $55 – $190. Chair massages start from $12 and go up to $60. If you want to work up a sweat before taking a dip, check out the remodeled fitness center. Starting at $20 a day, you have access to all the fitness equipment, steam room and complimentary bottled water, juice and fruit. Heading to SuperBook? 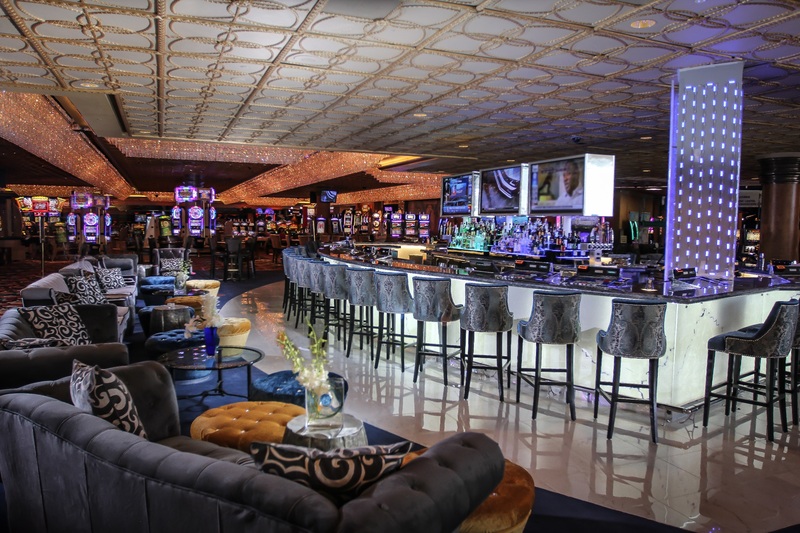 Check out the new International Bar located in the heart of the casino action. It’s hard to not think of the Rick James’ classic funk hit, “Superfreak” when you hear SuperBook. And that’s a good thing: Both certainly leave a lasting impression. The SuperBook is so big, it even has its own parking garage outside. It also has the world’s largest indoor 4k screen, with an astounding 240-foot-long LED video wall. This will definitely put a wow factor to your game watching. Perfect for football season, the SuperBook will fully transform into a three-level stadium experience with a Drafts Sports Bar & Grill, a 40-foot-long sports bar, as well as VIP club booths. We’d definitely drink a beer or two and catch a game here once everything is complete. The King is everywhere. 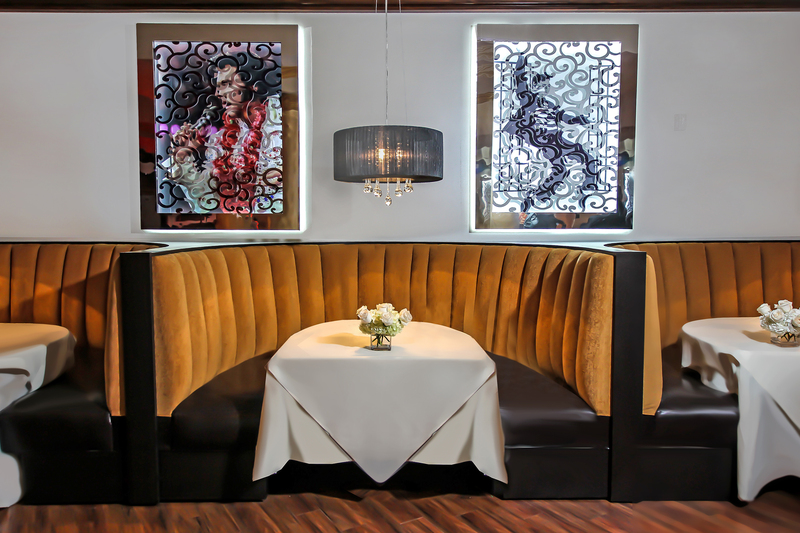 We like what they did here at Edge Steakhouse. What would a hotel renovation be without brand new restaurants? We first mentioned Sid’s Café offering peanut butter and banana sandwiches, as well as an exclusive concierge lounge with hot breakfast and nightly appetizers. But if you’re looking for something fancy and love steak, you’ll be thrilled with the award-winning Edge Steakhouse. This restaurant opened in late July and offers aged prime steak, Snake River Farm Wagyu beef, a fresh seafood tower and a fresh Caesar salad, prepared tableside. The wine selection is just as exciting. You can enjoy more than 450 varieties from everywhere, including Napa Valley’s Screaming Eagle. If you’re looking for something warm and filling (or let’s just say it – the perfect pre-game or hangover food), Silk Road offers three kinds of popular Asian noodles: Japanese ramen, Chinese rice noodle and Vietnamese pho. Open for dinner, this decent-sized eatery even offers a pleasant view, overlooking the gardens at Benihana. You don’t need to reserve a spot since it’s open seating. And if you follow a vegan, vegetarian or gluten-free lifestyle, there’s good news: The chefs at each restaurant love the opportunity to create new, exciting dishes for guests with all types of dietary requests. For a drink in a casual setting, the brand-new International Bar is located just a couple steps away from main lobby. Sip on your favorite drink while watching your favorite game on one of the many TV screens. This bar is open 24/7. The property-wide hotel renovations are still in the works, but that’s what makes it exciting. In the coming weeks, the 200,000-square-foot convention space, spa, hotel rooms and the rest of the SuperBook will be done. We’re positive Elvis would be proud.